Chinese Spare Ribs are one of the Chinese Restaurant Take Out favorites. Armed with a couple of ingredients from the Asian section of your local grocery store you won’t have to go to the restaurant for these anymore. I don’t know about you, but I personally love to get some Chinese take out once in a while. This is one cuisine that I often feel intimidated by, why? I don’t know. Growing up it was always a treat to go out for Chinese food. I can remember when one of the first Chinese restaurants opened in Jefferson City, Missouri. My Grandmother had to take me there. I think it was mostly because my Grandfather really liked meat and potatoes best, but I digress. When you get take-out there never seems to be enough of what you want. We have always gotten quite serious about dividing up the ribs in my house. Guess what, you can make these at home. These are quite easy to prepare. My recipe is for how to make these in the oven, but I bet they would be amazing on the grill. Now, to make these, you will need to buy a few key ingredients from the Asian section of your grocery store. You will need soy sauce, cooking wine, hoisin sauce, toasted sesame oil. You will also need honey, ketchup, and lots of fresh garlic. The hoisin sauce you can use later to make stir fry sauces, and other Asian dishes. The toasted sesame oil can go into salad dressings, the cooking wine you can use an Asian variety, but dry sherry will also work well. 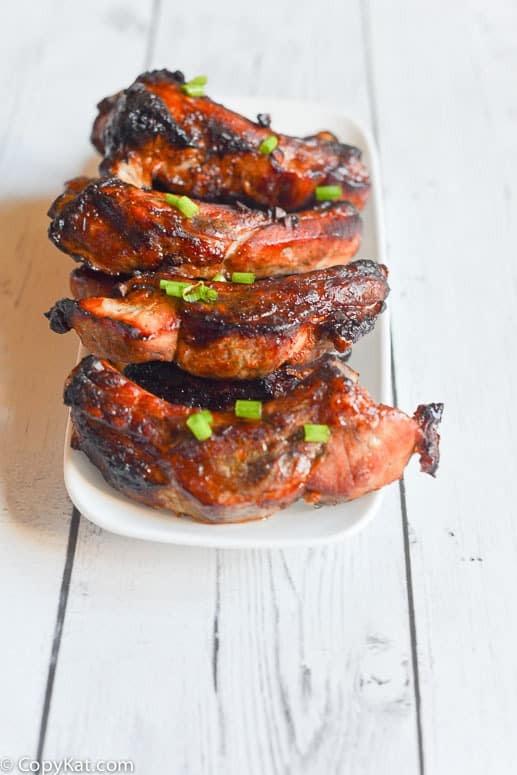 To make these succulent ribs, you will make this special Chinese spare rib sauce, you will need to make the marinade, allow them to soak in this flavor for a couple of hours or even overnight, then cook them the next day. I like to make these when pork ribs go on sale. Actually, I like to buy sale items the best, this way I feel like I am getting a great deal and a tasty meal. Love Asian inspired recipes? Be sure to check out these recipes. Love those Chinese spare ribs you get in a restaurant? Well, you can make them at home. In a medium sized bowl combine Hoisin sauce, sesame oil, soy sauce, rice cooking wine, five spice powder, chopped garlic, honey, and ketchup. Stir until the sauce if fully blended. Pour over pork spare ribs and marinate for at least 1 hour. These taste better if you can allow them to marinate a little longer.Bake at 375 for about 40 to 50 minutes. I would like to have a recipe for Chinese chicken wings and the duck sauce. I can’t seem to find them on any websites that takes like the ones you get at a Chinese restaurant. Wow. AMAZINGLY GREAT! THANK YOU SO MUCH! From today one this is my recipe.! Do you cut ribs when marinating them. The marinade is called Char Siu. The red color is from red yeast fermented tofu if authentic, red food coloring if not authentic. I am so happy I found your site and am looking forward to trying some of your recipes! I will be preparing Baked Steakhouse Potatoes to go with steak dinner this evening. Then these delicious ribs!! What is your favorite flavor of ribs? BBQ ORIGINAL… GOT A RECIPE?? ?